Details of the creature, which can reach up to 1.55m (5ft) in length and 6cm (2.3in) in diameter, were published in a US science journal. The giant shipworm spends its life encased in a hard shell, submerged head-down in mud, which it feeds on. Though its existence has been known for years, no living specimen had been studied until now. Despite its name it is actually a bivalve, which is the same group as clams and mussels. The "rare and enigmatic species", also known as Kuphus polythamia, is the longest living bivalve known to man, according to the study published in the Proceedings of the National Academy of Sciences of the United States of America (PNAS). The team of scientists from the US, the Philippines and France recently found and collected five giant shipworms in Mindanao in a marine bay. A video shows the scientists carefully cutting off one end of the shipworm's shell, before gently shaking it out. A long, slimy black creature is seen sliding out of the tube-like shell. It belongs to the shipworm family, whose members are usually much smaller and burrow and feed on rotting wood. The giant shipworm is unique not just for its size, but also for feeding on mud and marine sediment instead, using a type of bacteria. It therefore has a much smaller digestive system compared to other shipworms. 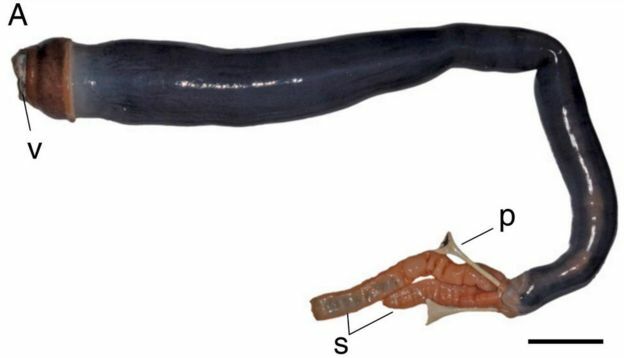 Scientists have found live specimens of the rare giant shipworm for the first time, in the Philippines, BBC reports.